It took Jonae Guest nearly all four years to do what any college basketball player should be able to do. Guest logged at least 24 minutes of playing time in each of Eastern Mennonite University’s last six games. 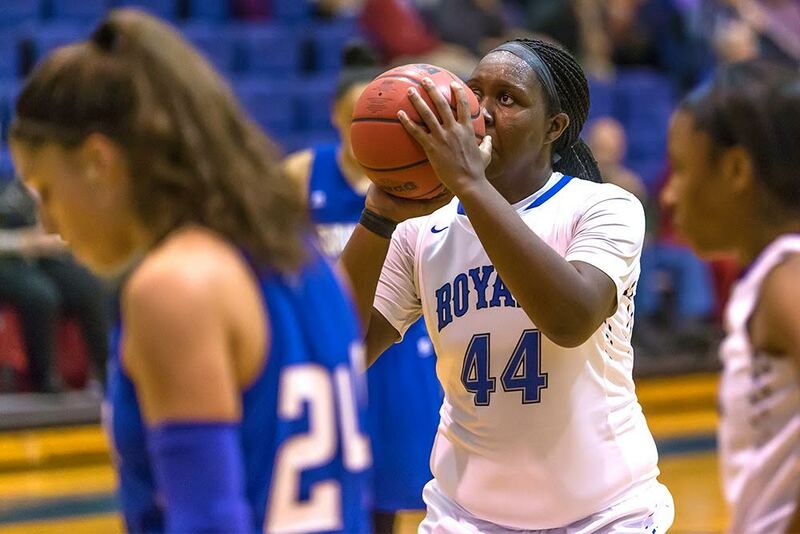 In the last three, she played no fewer than 29 minutes and registered double-doubles in the Royals’ win over Hollins on Saturday and loss at Emory & Henry on Jan. 14. The 32 minutes she played in EMU’s loss last week at rival Bridgewater was a career-high — she also had a career-best 25 points in the contest. Before this season, she only played more than 20 minutes in a game twice. “I wasn’t in shape when I was younger,” Guest said Monday before her team’s practice at Yoder Arena. “I had to get in shape to stay in the game longer. 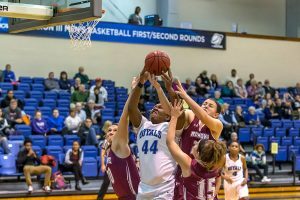 Jonae Guest grabs a rebound during a game against Roanoke College. EMU coach Kevin Griffin said Guest has dropped between 35 and 40 pounds over the course of her career. Standing at 6-foot-2 with the ability now to stay on the court for the majority of a game, Guest gives the Royals a much-needed presence in the paint. She’s the team’s only true center. The Potomac High School product is averaging 13.9 points and 10.4 rebounds per game in Old Dominion Athletic Conference action — both numbers lead the Royals. As the lone senior on the team, Guest said she felt like she had to take charge both on and off the court. Leaning on her leadership and consistent play, EMU is 10-6 overall and 5-3 in the ODAC with eight regular-season games left. The Royals are at Shenandoah tonight for a 7 p.m. tipoff. Griffin said Guest is the constant on the youngest team he’s ever had in his 12 seasons at EMU. “There is not a better kid in terms of when she walks in the room or the gym or down the hallway,” Griffin said of Guest. “She always has a smile on her face. I don’t remember a practice where we’ve had to wonder if she’s had a good day or a bad day and that’s huge. Junior guard Myneshia Walker, who shares the same major — sociology — as Guest, said her teammate set the tone for EMU’s 2016-17 campaign when she spent extra time running to get in shape during the summer. While wearing a wearing a knit hat with the logo of her favorite NBA team, the San Antonio Spurs — a team synonymous with leadership having won five NBA titles under coach Gregg Popovich — Guest said she’s embraced and enjoyed her leadership role. After graduation, Guest said she wants to use her sociology degree to work with children. Griffin said whatever Guest does beyond basketball she would succeed at. In the meantime, Guest said she wants to lead EMU to a strong finish and go on a run in the ODAC tournament. Regardless of what happens during the stretch run, Griffin said Guest would leave his program in a better place.